I had no clue New York Fashion Week started yesterday, until my sister emailed me and asked if I saw the Coach Spring 2015 Collection. Have you seen the Coach Spring 2015 Collection? Coach is cool again! With or without the blind-folded bunny, I am owning this tote bag. I also want these clogs. Coach Spring 2015 doesn't even look like Coach. Coach in recent years has had a very middle aged aesthetic. That's the problem with "affordable" luxury brands, everybody and their administrative assistant can afford it. So after riding the subways and seeing an ocean of those double-C logos (more recently, the Michael Kors speedy tote), suddenly you don't want to be associated with a brand. What was presented in New York on September 4, 2014 is very young and urban. I loved it. I want it. 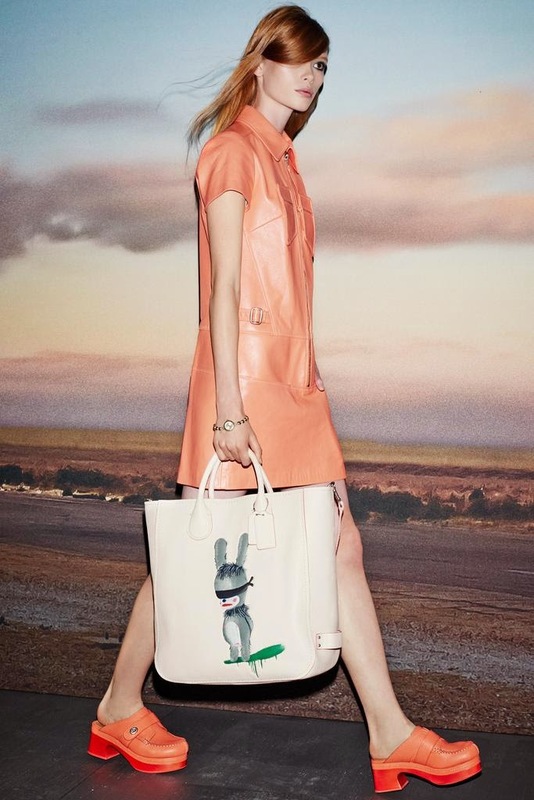 What do you think about Coach Spring 2015? See the rest of the collection after the break.